This Father’s Day gift in a jar is perfect for those dads that love to grill. Our BBQ rub is easy to make and Dad will love the flavor it gives to all the meat he grills this summer. 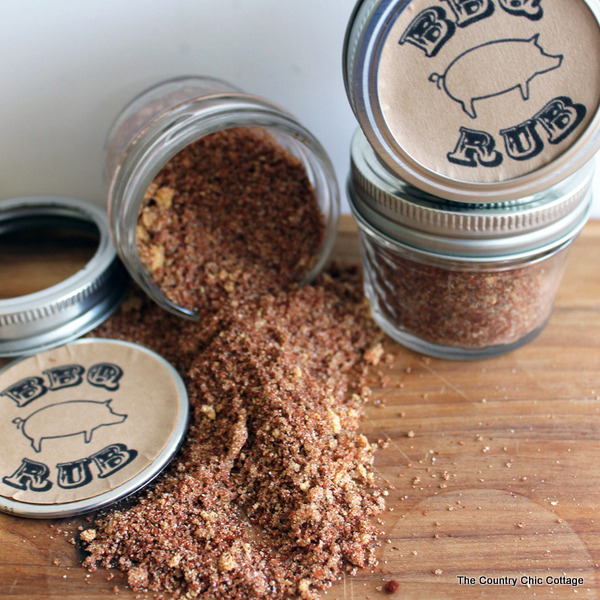 Grab your ingredients and get started on a batch or two of this BBQ rub today! This post is sponsored by Online Labels however all projects and opinions are my own. 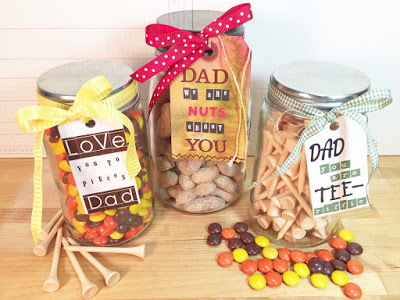 It is also a part of Craft Lightning where we post 15 minute Father’s Day craft ideas all week. You can see today’s ideas at the bottom of this post or catch up with the posts from day 1, day 2, and day 3. First you will need to make a batch of the BBQ rub recipe. Just follow the simple instructions below to whip up this recipe. 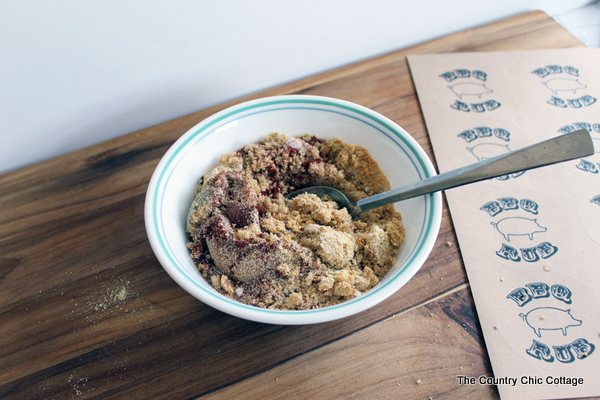 Combine all ingredients in a small bowl and mix well. Add to jars for storage or store in the freezer. Rub on all types of meats before grilling for added flavor. We added the BBQ rub to mason jars for a great gift idea for Dad. The recipe above made three of these mini mason jars. It would probably also do well in one pint jar. Love those labels? We do too! 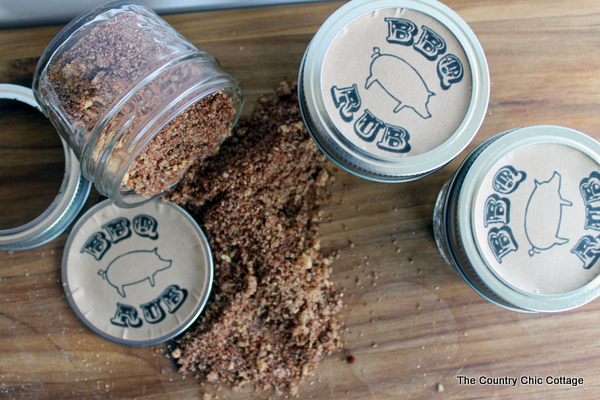 You can purchase the OL350 labels in kraft from Online Labels then click here to print the BBQ rub graphics onto them. Then just peel and stick the labels onto the jars. Your Father’s Day gift in a jar is complete and ready for gift giving! You can make this same BBQ rub for weddings, hostess gifts, or even yourself. Really it is great for any summer occasion. Make up a large batch and keep it on hand in your pantry at all times. You will love the flavor that it gives your grilling this season. Make this Father’s Day gift in a jar with the kids as well. They will love mixing up the spices while you print the labels. A simple gift idea that Dad will actually use! Add to jars for storage or store in the freezer. Rub on all types of meats before grilling for added flavor. 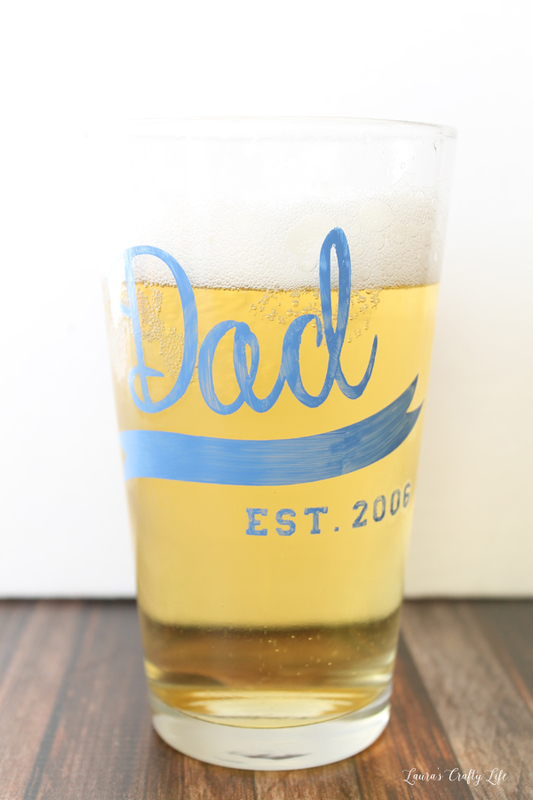 Are you ready for even more quick and easy Father’s Day gift ideas? See the 15 minute crafts below from our partners for this series. First up is Hey Let’s Make Stuff and these adorable prints that have foiled baby’s feet. I am in love with this idea! 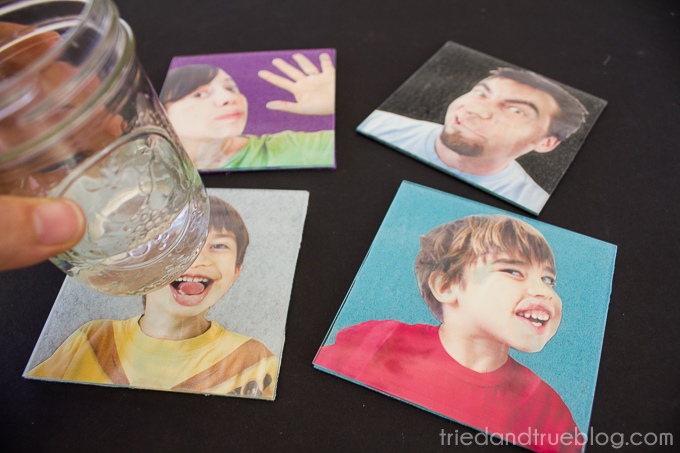 Next are some fun personalized coasters from Tried and True. Show off the funny side of Dad! 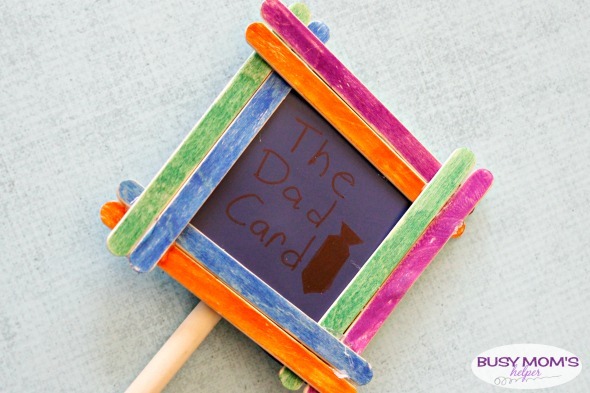 Make Dad a personalized mug with this simple craft tutorial from Laura’s Crafty Life. Does Dad love Star Wars? 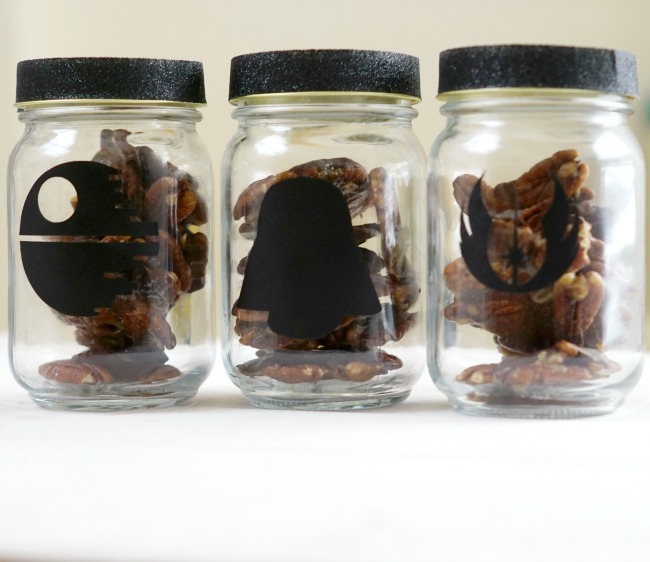 Try these treats in Star Wars mason jars from Clever Pink Pirate. 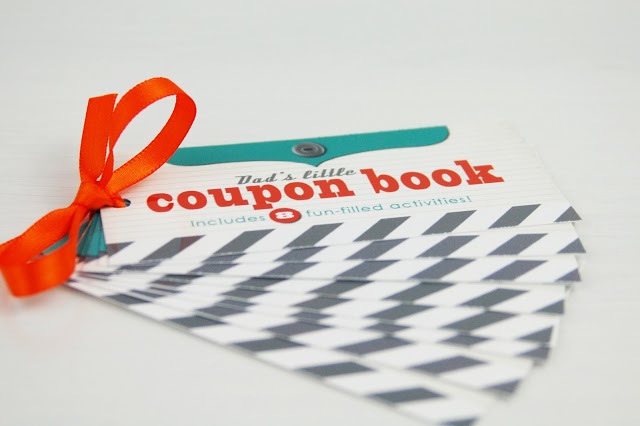 Dad will love this gift of this free printable coupon book from Jen Gallacher. 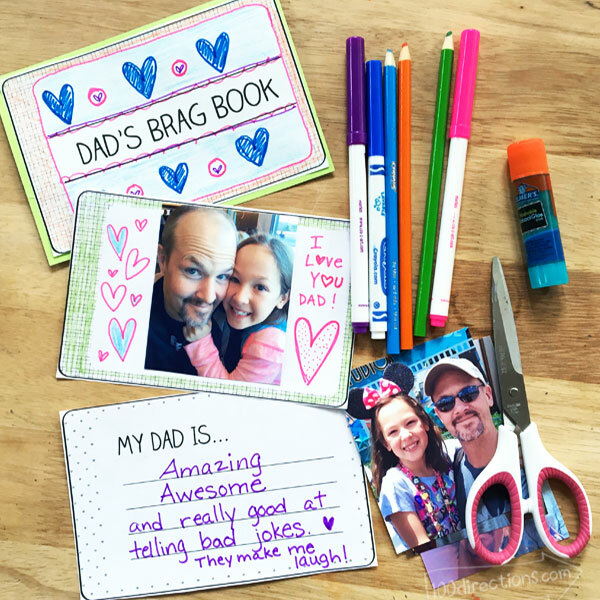 Kids will love putting together this brag book for Dad! 100 Directions makes it easy with a free printable. Let Dad know you love him with one of these fun Father’s Day mason jar gift ideas from Beth Watson. Our guest co-host for this series is Busy Mom’s Helper and she has a fun idea for giving “the dad card” this Father’s Day! 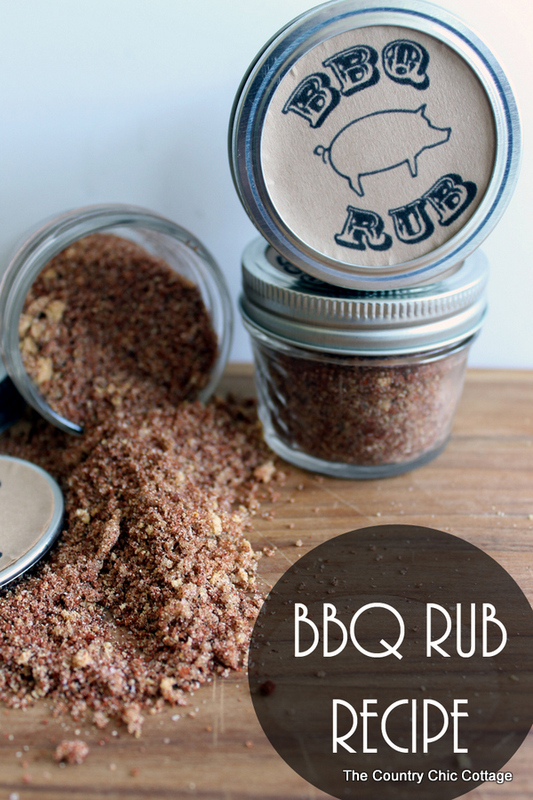 Make this BBQ rub recipe and give Dad a Father’s Day gift in a jar! You can also try one of the other quick and easy Father’s Day crafts above. You are sure to make Dad smile no matter what gift you choose! I so pinned this…what a neat idea! I have featured you this week over at Thursday Favorite Things Link Party! I can’t wait to see what you bring to the party this week. I too loved this rub. Oh course being a chef Iadded a few extra ingredients and we are using this idea in my kids holiday cooking class.